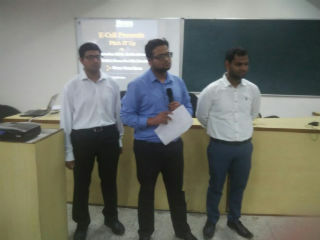 E-cell organized PITCH IT UP on Saturday 19th November, 2016 to introduce the PGDM students to the initial challenges faced by an entrepreneur. 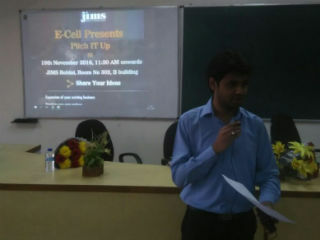 In the activity the students had to put themselves in the shoes of an entrepreneur and share their ideas on -1. Expanding an existing business, 2. Starting own venture, 3. Intra-preneurship (an innovation that can be initiated in the organization you are a part of). The participants had to present their creative idea in two minutes with the help of a power point presentation or with the help of a poster depicting the idea. The judges for the event were our alumni. Audience had two vote 2 best ideas. 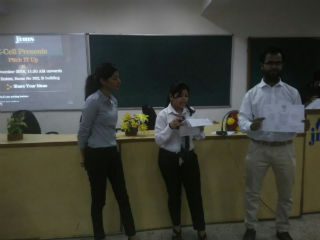 The first prize went to the team comprising Neeraj Singh Rathore, Sneha Gupta and Juhi Aggarwal PGDM batch(2016-2018). 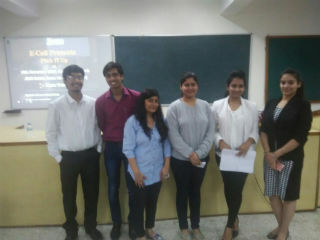 The second proze went to Aditi Sharma, Priyanka Gupta and Ankush Jain PGDM batch (2016-2018). Congratulation to the winners!